Bird feeding depends on the kind of bird you want to feed. The same as people, who eat various kinds of food to keep healthy and strong, birds also like some variety in their diets. Bird foods can range from birdseed to suet for insect eating species, to nectar for humming birds. Black sunflower seeds are also very good for a number of birds and are sure to draw a wide variety to your yard. You could also consider leaving out a little thistle seed and mullet, which have plenty of fat in them. WindowAlert has a wide range of bird foods that include good quality seed, suet as well as cute and decorative foods. You can pick from different kinds of seeds depending on which species you want to feed it to. It also has a wide combination of high quality seeds without any filler, as this prevents wastage and wont attract any undesirable wildlife. The decorative and cute food from WindowAlert are available in festive floral designs which attract a variety of birds. They contain sunflower, back oil, red millet and white millet. 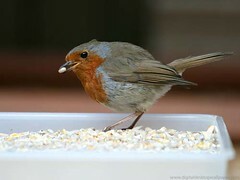 They also offer seeds for wild birds that can attract rare breeds to your garden – they aren’t only great for attracting new friends however, as they also make the perfect gift for bird enthusiasts.